I got my order wrong a while back and covered castling before check and checkmate. I am correcting that now, but it will look like I'm not posting anything for a while even though I am. Finally! Castling is done with. Good times. Remember to visit ComicsInTheClassroom.Net for all your all-ages school and school appropriate comics. Castling is just about finished. When it is complete I will backtrack and add the check and checkmate strips. This will mess up the numbering, but that's okay. More castling and some Avengers vs Xmen action! I only ever tweet my comics (these ones and my We Fight Robots comics). I got linked on reddit.com so hello to any new readers. I welcome comments and corrections. Oh, and I messed up the numbering...this is the 100th strip. I finally made it to the 100th strip! I have another 30 done and scanned in and I have at least another 100-150 left to do. Then I will redo the first eighty or so and then I will be ready to publish. I've been waiting to use that title for way too long. Thanks Rich Terfry! "I'm the jump in your moat - Splash!" New comic! I think I like the Queen's new hair colour. They are coming fast and furious now. I am now loving the computer lettering. Here is another computer lettered strip. It takes longer (at the moment) than hand lettering but I know it will get faster and I like the results. I am just trying something out. I just re lettered this strip using a font I made using my own printing. I'm not sure about it, but I want to see what anyone out there thinks. The original is two strips back. Good news to anyone wondering if I was ever going to get around to putting up more comics. Although I have been terrible at updating - really awful - I have spent the summer writing, drawing and inking strips. I now have built up a reserve of about thirty strips which I will be posting weekly. I decided that since I have so much trouble sticking to a posting schedule I would focus on the strips - something I haven't done in years. I want to finish the strips so I can publish as a book / ebook. I have a long way to go (every time I think I am close I realize that there are more topics to cover), but I am having fun again and I am motivated to finish. Panel 3 took me forever to figure out. New comic. Missed last week. It was report card week last week. BTW, you should check out Eric Dyck's newish comic, Slaughterhouse Slough. It's his comic chronicling his adventures as a Western Canadian returning from years in Eastern Canada. He had a strip while he was in Moncton which told of his adventures discovering this weird land, but I think his work now is the best I've seen it. I've been waiting to bring the Chess Ninja back for a long time. ENJOY! Don't forget - You can follow my comics on Twitter: @Scott_CitC. The "Three Rules of Checkmate" is one of the best things I can teach my beginning students. They become immediately more confident when they know they can understand and handle a checkmate situation. New comic. Good advice for anyone this time. New Comic! Don't forget - You can follow my comics on Twitter: @Scott_CitC. New comic. Lots of check comics on the way. 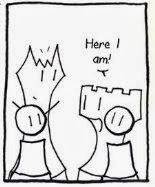 I am really back on track creating new Chess Comic strips and I was creating a castling strip that mentions Check and I realized that I hadn't covered it yet. I had the strips roughed out and I was publishing them after castling, and that time is now.